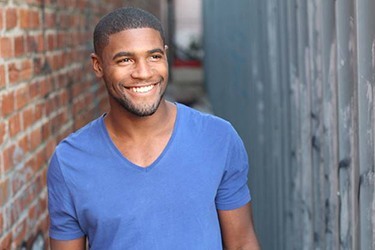 Even one missing tooth can have a dramatic impact on the way your bite functions and the confidence you have when sharing your smile with others. At DD Family Dentistry, we want each of our patients to maintain their healthiest smiles. When it comes to replacing missing teeth, our Carrollton dentist and team frequently recommend dental implant supported restorations as the gold-standard in care. If you’re missing two or more consecutive teeth, an implant-supported fixed bridge may be the best option. These restorations are fully self-supporting and mimic your smile’s natural structures, leaving you with a smile you’re proud to share. If you’re missing one or more teeth, it’s time to call our Carrollton dental office to schedule a tooth replacement consultation. We’ll examine your smile, review your treatment options, and create a restorations plan to delivers quality results. A traditional bridge is used to replace one or more consecutive teeth. The replacement tooth is fused to dental crowns, one on each side. Then, the crowns are affixed to healthy teeth on either side of the gap, creating a bridge. An implant-retained bridge works in much the same way. Rather than replacing one or more teeth, your implant bridge replaces two or more. Instead of relying on healthy teeth for support, your implant bridge uses two dental implant posts, one on each end, to anchor the restoration in place, restoring your smile from the roots up and protecting healthy dental structures. 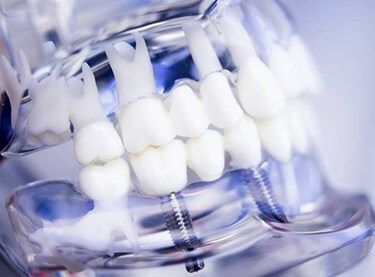 How Does an Implant Bridge Work? 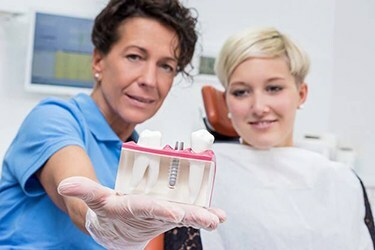 A dental implant bridge is placed over the course of several phases of treatment. We begin by preparing your smile and planning each step of the treatment process. Then, two dental implants will be positioned into the jawbone. Once in place, a protective cap is positioned over the implants to allow them to heal and fuse with the supportive structures. Once the implant posts are fully anchored into the jawbone, we design and craft your fixed bridge restoration. Then, we permanently affix the bridge to the two implant posts, leaving you with a flawless smile. Self-supporting – traditional bridges require the removal of healthy tooth structure in order to attach dental crowns to surrounding teeth for support. Implant bridges are fully self-supporting making them a better option for your oral health. Long-lasting – once in place, your dental implant-supported fixed bridge will last for 20 years or longer with proper care. That’s compared with traditional bridges that need to be replaced every five to ten years. 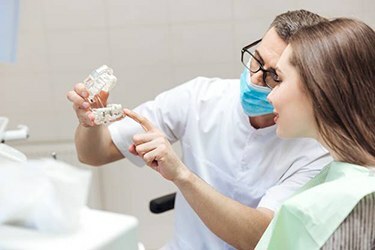 Natural-looking – replacing the entire tooth from the roots up and using the highest quality, tooth-colored materials, your end result will blend seamlessly into your smile. How do I Care for Your Implant Fixed Bridge? Once your implant bridge is in place, you can continue to brush and floss each day as usual. You may want to switch to a softer toothbrush or less abrasive toothpaste to avoid unnecessary wear to the replacement teeth. For larger bridges, it may also be beneficial to use an air or water flosser to remove plaque buildup between the restoration and the gum line. Implant-supported bridges will last for decades with appropriate care. Patients have a 95 to 98% success rate with implant bridges after 20 years, and many are able to maintain the same implant-supported fixed bridge for the rest of their lives.